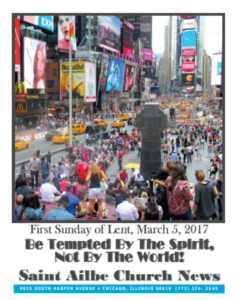 Be tempted by the Spirit? How can you by “tempted by the Spirit?” What Spirit? Today’s Gospel story from Matthew tells us: “At that time Jesus was led by the Spirit into the desert to be tempted by the devil.” Why would the Spirit lead Jesus in to a situation where He would be tempted? Weren’t we all taught to avoid situations that would lead us into temptation? While it is true that we need to avoid “evil-tempting situations and environments,” there is no way to avoid the encounters we call temptations. What we can do, though, is fortify ourselves to first of all recognize the temptations for what they are, and secondly be strong enough not to fall into their traps. Jesus was fortified with the power of the Spirit after spending forty days in prayer and fasting. As a result the Spirit was far more “tempting” than anything the devil could offer to pretend to offer. This Lenten Season, fortify yourself with the power of the Spirit! That is what our Lenten discipline of Prayer, Fasting and Almsgiving is all about!